^ 1.00 1.01 1.02 1.03 1.04 1.05 1.06 1.07 1.08 1.09 1.10 1.11 1.12 1.13 1.14 1.15 1.16 1.17 1.18 1.19 1.20 1.21 1.22 1.23 1.24 1.25 1.26 1.27 1.28 1.29 1.30 1.31 1.32 1.33 1.34 1.35 1.36 1.37 1.38 1.39 1.40 1.41 1.42 1.43 1.44 1.45 1.46 1.47 1.48 1.49 1.50 Peskin, M.; Schroeder, D. An Introduction to Quantum Field Theory. Westview Press. 1995. ISBN 0-201-50397-2. ^ 2.0 2.1 2.2 2.3 Hobson, Art. There are no particles, there are only fields. American Journal of Physics. 2013, 81 (211). doi:10.1119/1.4789885. ^ 3.00 3.01 3.02 3.03 3.04 3.05 3.06 3.07 3.08 3.09 3.10 3.11 3.12 3.13 3.14 3.15 3.16 Weinberg, Steven. The Search for Unity: Notes for a History of Quantum Field Theory. Daedalus. 1977, 106 (4): 17–35. ^ John L. Heilbron. The Oxford Companion to the History of Modern Science. Oxford University Press. 14 February 2003. ISBN 978-0-19-974376-6. ^ Joseph John Thomson. Notes on Recent Researches in Electricity and Magnetism: Intended as a Sequel to Professor Clerk-Maxwell's 'Treatise on Electricity and Magnetism'.. Dawsons. 1893. ^ 6.00 6.01 6.02 6.03 6.04 6.05 6.06 6.07 6.08 6.09 6.10 6.11 6.12 Weisskopf, Victor. The development of field theory in the last 50 years. Physics Today. 1981-11, 34 (11): 69–85. doi:10.1063/1.2914365. ^ Werner Heisenberg. Physics and Philosophy: The Revolution in Modern Science. Prometheus Books. 1999. ISBN 978-1-57392-694-2. ^ 8.0 8.1 8.2 8.3 8.4 8.5 8.6 8.7 8.8 8.9 Shifman, M. Advanced Topics in Quantum Field Theory. Cambridge University Press. 2012. ISBN 978-0-521-19084-8. ^ 9.0 9.1 9.2 9.3 't Hooft, Gerard. The Evolution of Quantum Field Theory. 2015-03-17. arXiv:1503.05007 [hep-th]. ^ Yang, C. N.; Mills, R. L. Conservation of Isotopic Spin and Isotopic Gauge Invariance. Phys. Rev. 1954-10-01, 96 (1): 191–195. doi:10.1103/PhysRev.96.191. ^ 11.0 11.1 11.2 Coleman, Sidney. The 1979 Nobel Prize in Physics. Science. 1979-12-14, 206 (4424): 1290–1292. ^ Sutton, Christine. Standard model. britannica.com. Encyclopædia Britannica. [2018-08-14]. ^ Kibble, Tom W. B. 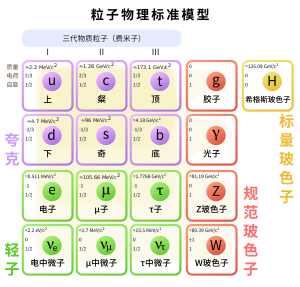 The Standard Model of Particle Physics. 2014-12-12. arXiv:1412.4094 [physics.hist-ph]. ^ 14.0 14.1 14.2 Polchinski, Joseph. String Theory 1. Cambridge University Press. 2005. ISBN 0-521-67227-9. ^ Schwarz, John H. The Early History of String Theory and Supersymmetry. 2012-01-04. arXiv:1201.0981 [physics.hist-ph]. ^ Common Problems in Condensed Matter and High Energy Physics (PDF). science.energy.gov. Office of Science, U.S. Department of Energy. 2015-02-02 [2018-07-18]. ^ 17.0 17.1 Wilczek, Frank. Particle Physics and Condensed Matter: The Saga Continues. 2016-04-19. arXiv:1604.05669 [cond-mat.mes-hall]. ^ 19.00 19.01 19.02 19.03 19.04 19.05 19.06 19.07 19.08 19.09 19.10 19.11 19.12 19.13 19.14 19.15 19.16 19.17 19.18 19.19 Zee, A. Quantum Field Theory in a Nutshell. Princeton University Press. 2010. ISBN 0-691-01019-6. ^ Fock, V. Konfigurationsraum und zweite Quantelung. Zeitschrift für Physik. 1932-03-10, 75 (9-10): 622–647. doi:10.1007/BF01344458 （德语）. ^ Becker, Katrin; Becker, Melanie; Schwarz, John H. String Theory and M-Theory. Cambridge University Press. 2007: 36. ISBN 0-521-86069-5. ^ Fujita, Takehisa. Physics of Renormalization Group Equation in QED. 2008-02-01. arXiv:hep-th/0606101. ^ Aharony, Ofer; Gur-Ari, Guy; Klinghoffer, Nizan. The Holographic Dictionary for Beta Functions of Multi-trace Coupling Constants. 2015-05-19. arXiv:1501.06664v3 [hep-th]. ^ Kovacs, Stefano. N = 4 supersymmetric Yang–Mills theory and the AdS/SCFT correspondence. 1999-08-26. arXiv:hep-th/9908171. ^ Veltman, M. J. G. (1976). "Methods in Field Theory, Proceedings of the Les Houches Summer School, Les Houches, France, 1975". ^ Brading, Katherine A. Which symmetry? Noether, Weyl, and conservation of electric charge. Studies in History and Philosophy of Science Part B: Studies in History and Philosophy of Modern Physics. 2002-03, 33 (1): 3–22. doi:10.1016/S1355-2198(01)00033-8. ^ Weinberg, Steven. The Quantum Theory of Fields. Cambridge University Press. 1995. ISBN 0-521-55001-7. ^ de Wit, Bernard; Louis, Jan. Supersymmetry and Dualities in various dimensions. 1998-02-18. arXiv:hep-th/9801132. ^ Polchinski, Joseph. String Theory 2. Cambridge University Press. 2005. ISBN 0-521-67228-7. ^ Nath, P.; Arnowitt, R. Generalized Super-Gauge Symmetry as a New Framework for Unified Gauge Theories. Physics Letters B. 1975, 56 (2): 177. Bibcode:1975PhLB...56..177N. doi:10.1016/0370-2693(75)90297-x. ^ Munoz, Carlos. Models of Supersymmetry for Dark Matter. 2017-01-18. arXiv:1701.05259 [hep-th]. ^ Morandi, G.; Sodano, P.; Tagliacozzo, A.; Tognetti, V. Field Theories for Low-Dimensional Condensed Matter Systems. Springer. 2000. ISBN 978-3-662-04273-1. ^ Parker, Leonard E.; Toms, David J. Quantum Field Theory in Curved Spacetime. Cambridge University Press. 2009: 43. ISBN 978-0-521-87787-9. ^ Ivancevic, Vladimir G.; Ivancevic, Tijana T. Undergraduate Lecture Notes in Topological Quantum Field Theory. 2008-12-11. arXiv:0810.0344v5 [math-th]. ^ Carqueville, Nils; Runkel, Ingo. Physics of Renormalization Group Equation in QED. 2017-05-16. arXiv:1705.05734 [math.QA]. ^ Haag, Rudolf. On Quantum Field Theories (PDF). Dan Mat Fys Medd. 1955, 29 (12). ^ 37.0 37.1 Buchholz, Detlev. Current Trends in Axiomatic Quantum Field Theory. 1998-12-03. arXiv:hep-th/9811233v2. ^ 38.0 38.1 38.2 Summers, Stephen J. A Perspective on Constructive Quantum Field Theory. 2016-03-31. arXiv:1203.3991v2 [math-ph]. ^ Sati, Hisham; Schreiber, Urs. Survey of mathematical foundations of QFT and perturbative string theory. 2012-01-06. arXiv:1109.0955v2 [math-ph]. ^ Jaffe, Arthur; Witten, Edward. Quantum Yang-Mills Theory (PDF). Clay Mathematics Institute. [2018-07-18]. Pais, A. Inward Bound: Of Matter and Forces in the Physical World reprint. Oxford, New York, Toronto: Oxford University Press. 1994 . ISBN 978-0198519973. Schweber, S. S. QED and the Men Who Made It: Dyson, Feynman, Schwinger, and Tomonaga. Princeton University Press. 1994. ISBN 9780691033273. Feynman, R.P. The Character of Physical Law. MIT Press. 2001 . ISBN 0-262-56003-8. Feynman, R.P. QED: The Strange Theory of Light and Matter. Princeton University Press. 2006 . ISBN 0-691-12575-9. Gribbin, J. Q is for Quantum: Particle Physics from A to Z. Weidenfeld & Nicolson. 1998. ISBN 0-297-81752-3. McMahon, D. Quantum Field Theory. McGraw-Hill. 2008. ISBN 978-0-07-154382-8. 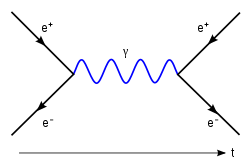 Bogolyubov, N.; Shirkov, D. Quantum Fields. Benjamin Cummings. 1982. ISBN 0-8053-0983-7. Frampton, P.H. Gauge Field Theories. Frontiers in Physics 2nd. Wiley. 2000. Greiner, W; Müller, B. Gauge Theory of Weak Interactions. Springer. 2000. ISBN 3-540-67672-4. Itzykson, C.; Zuber, J.-B. Quantum Field Theory. McGraw-Hill. 1980. ISBN 0-07-032071-3. Kane, G.L. Modern Elementary Particle Physics. Perseus Group. 1987. ISBN 0-201-11749-5. Kleinert, H.; Schulte-Frohlinde, Verena. Critical Properties of φ4-Theories. World Scientific. 2001. ISBN 981-02-4658-7. Kleinert, H. Multivalued Fields in Condensed Matter, Electrodynamics, and Gravitation (PDF). World Scientific. 2008. ISBN 978-981-279-170-2. Loudon, R. The Quantum Theory of Light. Oxford University Press. 1983. ISBN 0-19-851155-8. Mandl, F.; Shaw, G. Quantum Field Theory. John Wiley & Sons. 1993. ISBN 978-0-471-94186-6. Ryder, L.H. Quantum Field Theory. Cambridge University Press. 1985. ISBN 0-521-33859-X. Schwartz, M.D. Quantum Field Theory and the Standard Model. Cambridge University Press. 2014. ISBN 978-1107034730. Ynduráin, F.J. Relativistic Quantum Mechanics and Introduction to Field Theory 1st. Springer. 1996. ISBN 978-3-540-60453-2. Greiner, W.; Reinhardt, J. Field Quantization. Springer. 1996. ISBN 3-540-59179-6. Peskin, M.; Schroeder, D. An Introduction to Quantum Field Theory. Westview Press. 1995. ISBN 0-201-50397-2. Scharf, Günter. Finite Quantum Electrodynamics: The Causal Approach third. Dover Publications. 2014 . ISBN 978-0486492735. Srednicki, M. Quantum Field Theory. Cambridge University Press. 2007. ISBN 978-0521-8644-97. Tong, David. Lectures on Quantum Field Theory. 2015 [2016-02-09]. Zee, Anthony. Quantum Field Theory in a Nutshell 2nd. Princeton University Press. 2010. ISBN 978-0691140346. Brown, Lowell S. Quantum Field Theory. Cambridge University Press. 1994. ISBN 978-0-521-46946-3. Bogoliubov, N.; Logunov, A.A.; Oksak, A.I. ; Todorov, I.T. General Principles of Quantum Field Theory. Kluwer Academic Publishers. 1990. ISBN 978-0-7923-0540-8. Weinberg, S. The Quantum Theory of Fields 1. Cambridge University Press. 1995. ISBN 978-0521550017. Stanford Encyclopedia of Philosophy: "Quantum Field Theory", by Meinard Kuhlmann. Siegel, Warren, 2005. Fields. arXiv:hep-th/9912205.